O2’s UK HR team manage the implementation of the performance process into the business, ensuring that managers across the organisation are aware of their roles and responsibilities when it comes to managing the performance of their teams – and any actions they need to take to ensure performance is managed correctly. In 2005, O2 were looking for a system that would allow individuals to own and manage their personal performance, letting them set their individual objectives and drive their own development. The incumbent system was very structured and allowed no flexibility, customisation or corporate branding. In some cases, spreadsheets were used to hold much of their data. O2 needed a more technology-led approach to match their brand image. 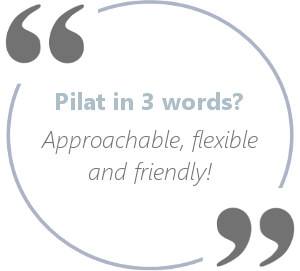 Moving from the very old, structured system, Pilat provided a flexible and cost-effective solution, which allowed O2 to build, customise and brand their Performance and Talent systems, to deliver exactly what they needed. The performance process is used to enter objectives, capture 1-2-1 notes, upload development plans, prepare notes for meetings, and complete performance reviews all from a single, easy to navigate dashboard. The system also allows for internal feedback from colleagues. The whole process is managed from one central place, making information easier to access for everyone. Employees can have access when they want it, which helps them engage with the company, own and manage their personal objectives and drive their individual development. The talent process is used by line managers to complete potential assessments of their team using the JDI (Judgement, Drive, Influence) model. Employees can set their own objectives and drive their own development as they wish – with everything recorded in one central place. New users are up and running in a short space of time as the system is extremely intuitive. 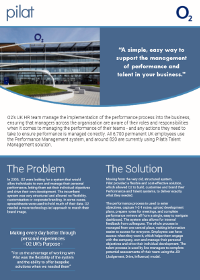 O2 use the performance dashboard to easily track completion of the various parts of their performance process and ensure all performance ratings are entered and calibrated by managers. “Being able to calibrate online is a great feature,” said Katy. “It allows our managers to have a great conversation about the performance ratings they have awarded, and make real time changes during calibration meetings. 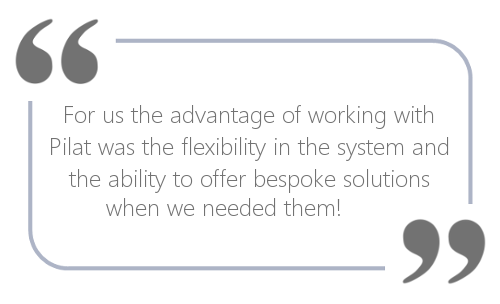 All employees can access the system at any time to update their objectives and, at set times during the year, line managers input their performance ratings. I think the flexibility of allowing users to log in as and when they like is a great feature and also that it is accessible from any device. Being a mobile company, this is a great feature for us! O2 is the commercial brand of Telefónica UK Limited and is the mobile network operator with the highest customer satisfaction in the U.K. according to Ofcom. With over 25 million customers, O2 runs 2G, 3G and 4G networks across the UK, as well as operating its nationwide O2 Wi-Fi service. O2 has over 450 retail stores and sponsors The O2, O2 Academy venues and England Rugby.